Your business is complicated. It’s quite possible that the administration, tracking, storage, retrieval and transportation of your products and services is taking far more effort than their actual production. You’re not alone. I’m here to help. All these symptoms do not add to your ability to produce better products and services, but they all cost money, take time, and drain vital resources. According to the National Institute of Standards and Technology, it takes approximately 20 times as long to deliver a product or service as the work it takes to actually produce it. We can do better with Lean Transformation. Measurable results will start within a few weeks of beginning your Lean Transformation. Although results vary by business sector, these are indicative of results in education, government, manufacturing, sales, banking, insurance, retail and medical fields. Kaizen Trek personnel do not arrive at you organization and start dictating how you should do your business. The 5S process is accomplished through trained, management-directed teams of your people who actually do the work. This is the first step in developing them to undertake improving their part of the business. Later, they may be asked to join a cross-functional team to tackle larger-scale challenges. 5S is not busywork or a consultant time generating ploy. (Most of it, after people are trained, is accomplished on your own.) 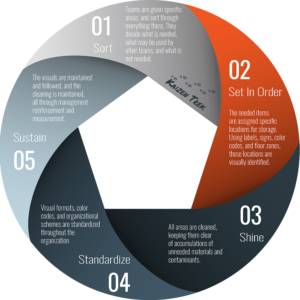 Extensions of 5S concepts form the basis of the entire Lean system: Lean is visual. Lean is measured. Lean is clean and organized. Lean is standardized, and Lean is team-based.